Adjust oven rack to upper middle position and heat oven to 400 degree. Grease 13 by 9 inch baking dish. Heat oil in 12 inch skillet over medium heat until shimmering. Add onions, ½ teaspoon salt, and ¼ teaspoon pepper and cook, stirring frequently, until soft and golden brown, 15 to 20 minutes. Add garlic and cook until fragrant, about 30 seconds. Add water and cook until nearly evaporated, scraping up any browned bits, about 2 minutes. Off heat, stir in olvies; set aside. Shingle half of tomatoes in even layer in prepared dish. Shingle half of poatatoes over tomatoes and sprinkle 1 teaspoon thyme, ½ teaspoon salt, and ¼ teaspoon pepper over top. Spread onion mixture evenly over potatoes. Sprinkle remaining 1 teaspoon thyme, ½ teaspoon salt, and ¼ teaspoon pepper over top. Bake, uncovered, for 1 hour. 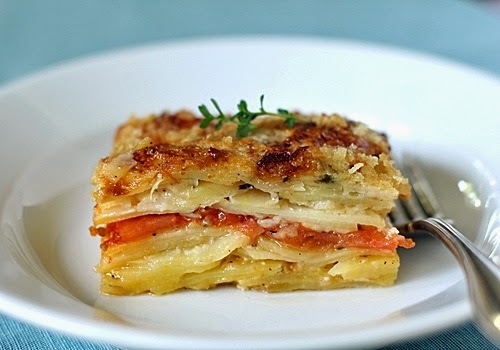 Sprinkle with Gruyere and continue to bake until cheese is browned and bubbly and potatoes are completely tender, 25 to 30 minutes longer. Let cool for 30 minutes. Serve.